Attention deficit hyperactivity disorder (ADHD)Attention deficit disorder (ADD) diagnoses have exploded in the last 20 years. As the number of children and adults diagnosed with this disorder increased, so has the concern about the effects of commonly prescribed drugs to treat it. Claims of over-diagnosis, the need to “pacify” energetic and creative children to make them comply with institutionalization, and the relatively unknown effects of strong psychoactive drugs on growing brains have made for eye catching headlines and stories. It has been used for thousands of years as a pain treatment (chronic pain and headaches). It influences our endocannabinoid system (Both Positively & Negatively) which is responsible for regulating both our body and brain. Especially when we are ill.
Studies have shown that both CBD & THC can be used successfully to treat a wide range of minor and major illnesses. CBD and the endocannabinoid system is being widely researched more each day and more clinical and business related developments are starting to be conducted much to the delight of patients relying on it for treatment. However, production of CBD and packaging is not regulated, so unfortunately there is no way to be sure about the quality of a product. Products that have additives or are made improperly can have side effects such as vomiting and headaches, so care must be taken to investigate the source of the product. 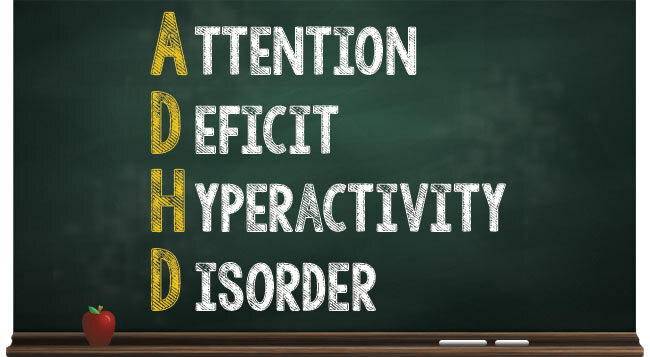 Attention deficit hyperactivity disorder (ADHD) and attention deficit disorder (ADD) are frequently used interchangeably, and the names referring to this syndrome have changed throughout the years. The current diagnostic standard is attention deficit/hyperactivity disorder (ADHD), which is then divided into one of three presentations or types: Inattentive, hyperactive, or combined. ADHD is a syndrome of the brain that, according to the Attention Deficit Disorder Organization, affects “executive functioning skills which includes important functions such as attention, concentration, memory, motivation and effort, learning from mistakes, impulsivity, hyperactivity, organization, and social skills.” Both males and females have ADHD, and although the disorder is thought of as a childhood issue, patients do not grow out of it. Many adults have undiagnosed ADHD. The disorder is caused by chemical and structural differences in the brain, likely due to genetics. Researchers have identified specific genes in people with ADHD. They have also identified structural and chemical differences in the brain that affect the way the brain sends signals, specifically in the areas of the brain that are focused on attention, reward and consequences. There is evidence that serotonin and the dopamine system are affected as well. Treatment for ADHD is a combination of behavior therapy and medication. Through behavior modification, many people who have ADHD can learn to focus, can learn coping strategies, and can learn how to change or re-direct a line of thinking. Learned behaviors can overcome many challenges of ADHD, and many adults are able to function well and successfully without medication at all. Sometimes medication is the best choice, especially with children who may have a more difficult time with behavior modification, but there are multiple side effects associated with this choice. Some side effects of modern ADHD medicationare sleep problems, decreased appetite, delayed growth, headaches and stomachaches, rebound irritability when the medication wears off, tics, moodiness and irritability. The aim of treatment is to give as little medication as possible to minimize side effects to achieve the desired goal. Can CBD Oil Be Used To Treat ADHD? If you type the question into a search engine, “how can CBD oil be used for ADHD?”, you will get a myriad of answers, mostly from chat rooms or informal comments on web pages. There are a lot of people who have stories about self-medicating with cannabis products. Is there any proof that they really work? There are not many studies in this area, but there are a few that examine the interaction between cannabinoids and ADHD. One study reported by Clinical Nuclear Medicine stated that ADHD and substance abuse disorders frequently go hand in hand. Previous studies show that both disorders result in a change of dopamine transporter density in the brain. Researchers in this study wanted to compare dopamine transporter density in four groups of test subjects: ADHD with substance abuse, ADHD without substance abuse, substance abuse only, and neither ADHD nor substance abuse. The test subjects were 64 adolescent males. The results showed that the test subjects who had ADHD and substance abuse had lower levels of dopamine transporter density in the brain. Researchers concluded that cannabis and cocaine use may be responsible for the results, and would explain why adolescents would attempt to self-medicate. Another study from the from National Center for Biotechnology Information (NCBI) showed a definite correlation between ADHD and cannabis use disorders. While they did not give details as to why the correlation exists, they concluded that having ADHD as a child increased the risk of cannabis use disorders as a young adult. A larger study by NCBI, using 2,811 cannabis users, was done in 2012. This study looked at the association between types of ADHD and cannabis use. A survey was given to the study subjects, asking them about the ADHD symptoms they experience while not using cannabis. More of the daily cannabis users were of the hyperactive type of ADHD than the inattentive type. Researchers concluded that the study might help in identifying the types of ADHD patients that would be likely to self-medicate with cannabis. Further, they stated that the findings support research that links cannabinoid receptors to regulation of brain function. As you can see, most of the studies that have researched links between cannabinoids and ADHD are aimed more at preventing substance abuse than treating ADHD. However, the underlying information suggests that using CBD cannabinoids from CBD oil does have a neurological effect, causing many people with ADHD to continue to self-medicate with cannabis. The literature not only suggests neurocognitive disadvantages to using marijuana in the domains of attention and memory that persist beyond abstinence, but suggest possible macrostructural brain alterations (e.g., morphometry changes in gray matter tissue), changes in white matter tract integrity (e.g., poorer coherence in white matter fibers), and abnormalities of neural functioning (e.g., increased brain activation, changes in neurovascular functioning). Earlier initiation of marijuana use (e.g., before age 17) and more frequent use has also been associated with poorer outcome. The study also mentioned that cannabis use in adults results in poorer cognitive function as well. An interesting side note is that researchers in several studies suggest that treating with CBD oil alone, not treating with marijuana, is of interest for future study as the results may be different. As of yet, clinical research shows that some cannabinoids like CBD do have an effect on the brain which may improve symptoms of ADHD. The effects of THC are not clinically proven and need more research. Until then, caution should be used especially when considering cannabis products for use in adolescents. CBD Oil for ADHD: How Is ADHD Treated? Pharmaceuticals – Doctors often prescribe meds that will help people with ADHD gain focus. Behavioral therapy – Therapy and counseling can help people with ADHD. Please Note: Before using medical cannabis for any major or minor illnesses or disorders please seek professional medical advice before doing so. Aharonovich, E., Garawi, F., Bisaga, A., Brooks, D., Raby, W.N., and Rubin, E. (2006). Concurrent cannabis use during treatment for comorbid ADHD and cocaine dependence: Effects on outcome. The American Journal of Drug and Alcohol Abuse, 32(4), 629-635. Retrieved from https://www.tandfonline.com/doi/abs/10.1080/00952990600919005. Attention-Deficit/Hyperactivity Disorder. (n.d.). National Institute of Mental Health. Retrieved from https://www.nimh.nih.gov/health/topics/attention-deficit-hyperactivity-disorder-adhd/index.shtml. Cooper, R.E., Williams, E., Seegobin, S., Tye, C., Kuntsi, J., and Asherson, P. (2017, August). Cannabinoids in attention-deficit/hyperactivity disorder: A randomised-controlled trial. European Neuropsychopharmacology, 27(8), 795-808. Retrieved from https://linkinghub.elsevier.com/retrieve/pii/S0924-977X(17)30237-7. Hadland, S.E., Knight, J.R., and Harris, S.K. (2015, February-March). Medical marijuana: Review of the science and implications for developmental behavioral pediatric practice. Journal of Developmental & Behavioral Pediatrics, 36(2), 115-123. Retrieved from: https://www.ncbi.nlm.nih.gov/pmc/articles/PMC4318349/#. Kelly, C., Castellanos, F.X., Tomaselli, O., Lisdahl, K., Tamm, L., Jernigan, T., Newman, E., Epstein, J.N., Molina, B.S.G., Greenhill, L.L., Potkin, S.G., Hinshaw, S., Swanson, J.M., and MTA Neuroimaging Group. (2017). Distinct effects of childhood ADHD and cannabis use on brain functional architecture in young adults. NeuroImage: Clinical, 13, 188-200. Retrieved from https://www.sciencedirect.com/science/article/pii/S221315821630170X. Loflin, M., Earleywine, M., De Leo, J., and Hobkirk, A. (2014, March). Subtypes of attention deficit-hyperactivity disorder (ADHD) and cannabis use. Substance Use & Misuse, 49(4), 427-34. Retrieved from: https://www.tandfonline.com/doi/abs/10.3109/10826084.2013.841251?journalCode=isum20. Milz, E., Grotenhermen, F. Successful therapy of treatment resistant adult ADHD with cannabis: Experience from a medical practice with 30 patients. Abstract book of the Cannabinoid Conference 2015, September 17-19, Sestri Levante, Italy, page 85. Retrieved from: http://cannabisclinicians.org/wp-content/uploads/2016/02/SUCCESSFUL-THERAPY-OF-TREATMENT-RESISTANT-ADULT-ADHD-WITH-CANNABIS.pdf. Mitchell, J.T., Sweitzer, M.M., Tunno, A.M., Kollins, S.H., and McClernon, F.J. (2016) “I Use Weed for My ADHD”: A Qualitative Analysis of Online Forum Discussions on Cannabis Use and ADHD. PLoS ONE, 11(5): e0156614. Retrieved from http://journals.plos.org/plosone/article?id=10.1371/journal.pone.0156614. Patel, R.S., Patel, P., Shah, K., Kaur, M., Mansuri, Z., and Makani, R. (2018, January). Is cannabis use associated with the worst inpatient outcomes in attention deficit hyperactivity disorder adolescents? Cureus, (10)1, e2033. Retrieved from: https://www.ncbi.nlm.nih.gov/pmc/articles/PMC5841924/. Patel, S., Rademacher, D.J., and Hillard, C.J. (2003, September). Differential regulation of the endocannabinoids anandamide and 2-arachidonoylglycerol within the limbic forebrain by dopamine receptor activity. The Journal of Pharmacology and Experimental Therapeutics, 306(3), 880-888. Strohbeck-Kuehner, P., Skopp, G., and Mattern, R. (2008). Cannabis improves symptoms of ADHD. Cannabinoids, 3(1), 1-3. Retrieved from http://cannabis-med.org/data/pdf/en_2008_01_1.pdf. What Is Attention Deficit Hyperactivity Disorder? (n.d.). WebMD. Retrieved from https://www.webmd.com/add-adhd/guide/attention-deficit-hyperactivity-disorder-adhd.